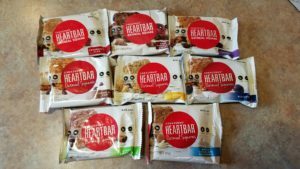 Had the opportunity to review these bars during our time in Seattle with Evanna‘s birth and stay in NICU. I preface the review with that for two reasons: it is long overdue and it was the perfect time for them, since during the NICU stay, I wasn’t exactly on a regular eating schedule. These bars were a great snack and occasional meal replacement. As for taste, I was pleasantly surprised. Tasty, but not overbearing with some of the flavors used, like bananas and cranberries. The combinations worked surprisingly well, too. For example, my favorite ended up being the one I avoided, thinking it would’t be good: Cranberry Flax. But what are they like, you ask? If you’ve had similar types of bars before, the comparison I’d make is to Clif Bars, but lightly smaller with less sugar, fat, sodium, and calories…and (in my opinion) more flavor. Check them out, either at Amazon or from their website direct (where you can get 10% off using the code BLOGGER10 at checkout). Disclaimer, thanks to the FTC: I did in fact receive a sample of this product for the review. I ate them, I enjoyed them, I wrote about them…but their receipt did not affect my review. If you wanted slanted coverage, please review the presidential campaign of 2016.